Although notebooking is a simple teaching method, it's hard to define, so it's no wonder people ask, "What is notebooking?" 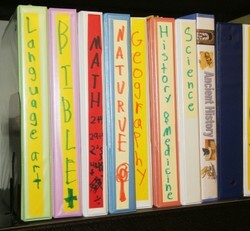 Notebooks can hold anything that reflect what you have learned during homeschool lessons. A basic notebooking page is a written narration of that day's material. An image or drawing is typically used to dress up the text-filled page. But notebooking can include many different types of narration. In fact, I have compiled a list of 50 Things to Put into a Notebook. All you need are notebooks and the homeschool supplies that you probably already have -- pencils, paper, glue, scissors, markers. Most notebookers use three ring binders and find that a three hole punch is a worthwhile investment. But when you are just starting out, stick with the supplies you have on hand. No matter what type of curriculum you use, notebooking works. After a lesson, have your child create a notebooking page about what he just learned. His page can include written text, pasted images, drawings, diagrams, maps, etc. NOTE: If you use a traditional, textbook curriculum, notebooking can take the place of many of the comprehension questions and worksheets that you normally do. When dad comes home and asks what your children learned, the notebooks are full of detailed answers. Even weeks later when you need to look up a fact, you can reference the notebook as an authority. A child comes to take great pride in his notebook as its contents grow over the weeks and months of a school year. Furthermore, if your state requires portfolio documentation, notebooks are perfect. Want to Know More About Notebooking? For less than the cost of a single workbook, Notebooking Success eBook walks you through exactly how to use notebooking in your homeschool no matter what style you use -- classical, Charlotte Mason, delight directed, or textbook. The Notebooking Fairy is a blog devoted exclusively to homeschool notebooking. There you will find Q & A articles about implementing notebooking, tutorials, how-tos, and maybe best of all, free printable notebooking pages. This is great. Check out the photo gallery on my blog page from my first year with Math Notebooking with 4th graders. Great Wizz, just starting the homeschooling journey with my oldest so I need all the ideas I can get! well this was woderful! its the same in college and grad school then...a portfolio as you said of all the research done to learn a subject! Thanks for explaining notebooking. It looks pretty cool. Thanks for explaining what notebooking is. I think it is a great idea. I also enjoyed reading your blog. I love notebooking and wish I had done more of it when my kids were younger! My sister is an elementary-school teacher and she recommended this for my daughter--even if we're just doing preschool-type learning at home. Thanks for the tips! As my children are getting older, we have been switching from lapbooking to notebooking. Either way they are excellent ways to learn and remember. I love the concept of Notebooking and wished that it had been around when I was in school.